I am a lucky man. 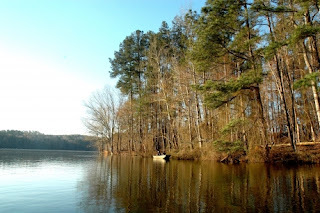 Yesterday I was able to hit the water and fish the 3rd annual UNC Charity Bass Fishing Tournament. It was a day of ups and downs, tough fishing and a lot of work. But for my partner Santosh and I, it paid off and for the second year in a row we brought home the victory for the good guys. 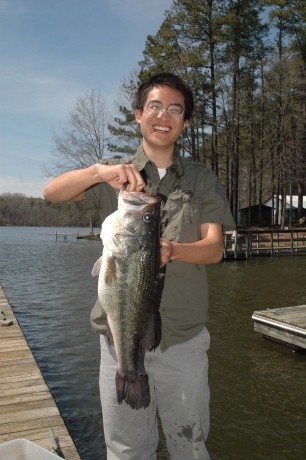 When the inaugural event was announced in 2011, the hope was that fishing teams/clubs from NC State, UNC-Greensboro and others would join in the competition, but that never materialized. So it has been a Duke-UNC rivalry, although not nearly as fierce or competitive as the one that takes place on the hardwood. However, I can assure you that every team there wanted to win...and wanted to win badly. I wasn't able to fish the event in 2011, but last year Santosh and I put together a solid post-spawn bag and took the victory by nealry 5 lbs. Originally I didn't think I would get a chance to defend the title, but as luck would have it, things worked out and I was able to join Santosh and the rest of the Duke team at the lake. The event is held at University Lake in Carrboro. I like the lake, but have fished it only once before - at the tournament last year. All of the teams rent jon boats from the lake with identical motors and gear so that the playing field is level in that respect. 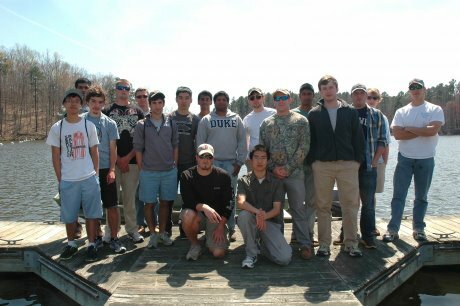 This year, 18 participants hit the water - with 6 UNC teams and 3 Duke teams. The bite was setting up to be completely different than last year with some bass deep, some staging in pre-spawn mode and probably a few scattered spawners. Santosh and I came up with a plan to target points with wood cover, deep banks, drop offs adjacent to flats and other areas where fish typically stage. We also wanted to use the wind to our advantage. As we would find out, our plan wasn't perfect, but it worked. Everyone launched around 7:45 AM. We immediately headed to a long tapering point with stumps and brush. But we didn't get bit there and knew it would fish better when the wind picked up later in the day. So we motored across to a deeper bank and started flipping into wood cover. Around 8:30 AM I got a good bite. I felt my plastic snag on a stick and when I popped it off the fish inhaled it. I knew it was a solid fish and after a fun fight and some acrobatics we had him in the net. We estimated he went around 4-4.5 lbs and suddenly we were feeling good. Santosh put him in the livewell - a large, water filled cooler with an aerator pump taped to the side - and we went back to fishing. Within the next 20 minutes I had bite number 2. I tossed my plastic worm toward a downed tree and let it sink. I actually let out a grunt of disgust as my cast wasn't as close to the tree as I had hoped. But apparently the fish didn't care. I felt a slight tick and saw the line start to move toward deep water. It was on! Moments later I saw the fish flash and knew it was big. Then came the slow-motion moment. The fish was headed back toward the tree. I leaned it into her with my Carolina Custom Rods - Finesse Special and was able to turn her away from the branches - but she was coming up. As she breached the surface, Santosh and I let out a collective, "holy _____." The rest of the fight was a blur, but she finally tired and Santosh provided a perfect net job. As I unhooked her, we repeated the same phrase we had used when we first saw the fish jump. Measuring 23", bass number two was in the livewell. We then ran a few patterns that should have worked, but didn't. I suspect some of it could be chalked up to right place, wrong time - areas that would have fished better after the water warmed more in the afternoon. We decided to fish down a long bank that was good to us the year before. Santosh had a couple of short strikes, but other than that it was dead. We were beginning to worry. We couldn't put our finger on a reliable pattern and there were enough boats on the water (both competitors and rec fishermen) that it was hard to get a good stretch of water to ourselves. Just before noon we made a move up the lake to an area we had caught a bunch of 12"-15" bass last year. We figured that if nothing else, we may be able to fill our limit with short fish. On the way, we saw one angler catch a 3-4 lb fish on a jerkbait on a windy point - a pretty textbook pre-spawn bite. The problem was that because of the lakes shape and the wind direction, windy points were hard to find. But we kept that in mind and headed for a deep bank with scattered wood cover. We fished the first 20+ blowdowns without a sniff. I was beginning to day dream of a nap while regretting not having brought my depth finder. Then came the day changer. While I was changing baits, Santosh was flipping into a large laydown with a plastic lizard. The bait snagged, so I picked up another rod and said, "let me throw one cast in there before we go in and get it." I cast toward the base of the tree on the deep edge. The fish inhaled the bait on the fall and by the time I reeled in the slack she was trucking at full speed. We both saw her at the same time and that familiar phrase from the morning was again being repeatedly spoken. The fight wasn't nearly as long or intense, as Santosh came up with another awesome net job. He scooped her and swung her into the boat. I lipped her, unhooked the bait and let out a huge sigh of relief. She measured right at 22" and had a gut that rivaled Santa Claus. Bass number three was in the livewell. After a couple of fist bumps we retrieved Santosh's bait and went back to fishing with just under two hours before the weigh-in. The rest of the day was slow. In fact, we didn't get another bite. We even tried small baits hoping for a couple short bass to complete our limit, but nothing wanted to bite. At 2 PM everyone met back at the dock. There were rumors of some 5 fish limits, a few boats with 4 fish and some big fish being caught. We knew we were in solid shape, but weren't sure if our three bass would hold up. The first few teams weighed in with limits under 8 lbs. One team had a nice fish that was a little over 7 lbs, but only one other fish which was less than a pound. The weight to beat, I believe, was around 10 lbs when we weighed in. We tried to keep our fish a secret until the very last minute. Only our Duke teammates had looked inside our cooler and we hadn't told anyone how we did. I wet my hands and pulled out the 4+ lber first, remarking, "I'll start with the small one." That drew an array of comments from the crowd. There were a couple exclamations of "holy crap" and a couple of folks that I don't think believed us. Then Santosh pulled the 22-incher from the cooler and announced it as the second biggest. Now we had everyone's attention. Finally, I lifted the 23" fish from the cooler and put her in the weighing bin. They weighed a combined total of 18 lbs 9 oz. The biggest was 7 lbs 13 oz, the second 6 lbs 8 oz and the smallest was 4 lbs 4 oz. It was a heck of a good day on the lake! We snapped some photos and released the fish alive and kicking. I should note that 7 lbs 13 oz ties, exactly, my personal best largemouth. Since the other - a river bass, was a little longer, he gets the nod as the PB...but it was super close! My two big fish (sorry about the blood). Although it is hard to tell, the one on the right was the bigger fish. A couple more teams weighed in after us including one 5 fish limit that looked solid - including a big kicker. 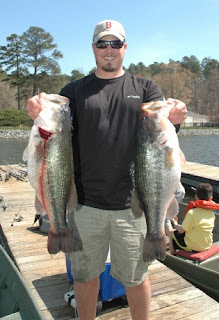 In fact, they completed their limit with a solid 3.5 lb fish just minutes before the weigh-in. But the 7 lb 8 oz kicker wasn't enough as the bag totaled 14 lbs 12 oz. Santosh and I were back-to-back champs...and it felt darn good. It was a tough day of fishing and a really good group of folks. There was a lot of good spirited joking, trading of fishing tips and mutual respect. Behind it all, that is what the Duke-UNC rivalry is all about. Best yet, 100% of the proceeds of the tournament go to a charity of the winners choosing. Santosh and I were torn between Schoolhouse of Wonder and the Ronald McDonald House-Durham. We decided to flip a coin and it turned out that the Ronald McDonald House won. Although I was rooting for SHOW, RMH is a really great organization. 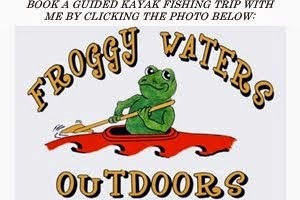 In fact, I have been trying to get a program set-up with them to take folks kayak fishing and Santosh has been volunteering his time there this year. He said that money has been really tight for them and that the donation will go a long way to re-stock items in the house. That makes victory feel a whole lot better. 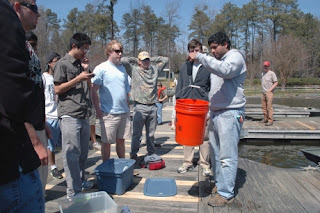 A big thanks to the UNC Fishing Club for hosting the event, the folks at the lake and OWASA for all of their help and hard work, Andy and Jason who reported for The Daily Tar Heel (click for their write-up - although some of it makes me shake my head), and to all of the other guys who came out to compete and have fun. I am also really proud of all of my Duke teammates who went out there, fished super hard and brought fish to the weigh-in during some tough conditions. Another thank you, to the companies who help me catch more fish - Carolina Custom Rods, Abu Garcia, Deep Creek Lures, Columbia Sportswear and Smith Optics. And finally, to the beautiful Mary May Pratt for accepting my fishing addictions and loving me anyway. Until next time, tight lines....and GO DUKE! Congrats Drew, Santosh, and the rest of the Duke team! Thanks so much for considering Schoolhouse of Wonder for a potential donation. We gladly welcome and appreciate every single dollar and/or wishlist item (http://schoolhouseofwonder.org/get-involved/wishlist) that comes our way. AND we gladly cheer for the Ronald McDonald House-Durham. One of our Schoolhouse parents/grandparents is a volunteer there and we regularly hear great stories. Well done UNC and Duke fishing teams and RMH! Thanks Wendy and Kevin. And I can only wish, Kev. Hopefully next week! Still waiting on my sink-tip fly line to come in. I know that you are all teams are very passionate about fishing. Keep it up. Best of luck.